Butter is approximately one fifth water, which must be cooked away before the remaining cream components will brown. To get 8oz of brown butter, you’ll need to start with at least 10oz (two and a half sticks), but I usually just begin with three full sticks and store the extra in the fridge for later use. Slice the butter into 1” cubes and heat in a skillet over medium high heat. I prefer to use a stainless skillet rather than non-stick, as the dark surface of non-stick makes it tough to observe the browning process. The butter will begin to bubble and crackle as it cooks. Stir gently on occasion, just to keep things moving. After several minutes, the crackling will cease and the foam will settle down. Pay careful attention from this point onward, both to the color and the aroma. The color will change from golden to tawny to caramel, and the aroma will become increasingly nutty and rich. When it reaches that rich caramel color, remove from the heat and allow it to cool for at least 15 minutes. Measure out 8oz and reserve any remaining brown butter for another use. Use an electric mixer to cream the brown butter and sugars together on medium-high in a large bowl for 3 minutes. The mixture will look like very wet sand, and not at all like the fluffy clouds of heaven you normally get from creaming together butter and sugar. Add the eggs and the vanilla and beat on medium speed for another 2 minutes until smooth, scraping the bowl a few times as needed. In another bowl, stir together the flour, baking soda, baking powder and salt. Add this dry mixture to the wet ingredients and stir, either by hand or on low speed with the mixer, until just combined. 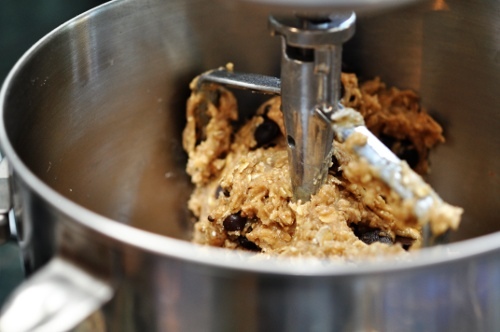 Add the chocolate chips and the oats, stirring again until everything is fully combined in a unified ball. Wrap the ball of dough in plastic wrap and chill for at least 30 minutes. If you plan to chill the dough for more than an hour, take it out of the fridge 15 minutes before you plan to bake so the dough will have time to soften a bit. It’s a little fussy, I know. In the meantime, preheat the oven to 350 and line a cookie sheet or two with parchment. 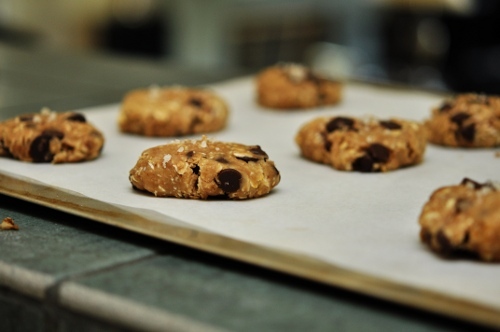 When you are ready to bake, scoop the dough into ping pong-sized balls and arrange on the prepared cookie sheet. Leave at least 2 inches between each cookie. Flatten each ball slightly with the heel of your hand, forming small disks. Sprinkle each disk with a pinch (just a pinch!) of grey salt and bake for 12 minutes. The edges should be slightly golden and the centers should look every so slightly underdone. Cool on the cookie sheet for 5 minutes, then on a rack for as long as your self-discipline will allow, ideally at least 10 minutes. Makes approximately 24 large cookies. Welcome back! 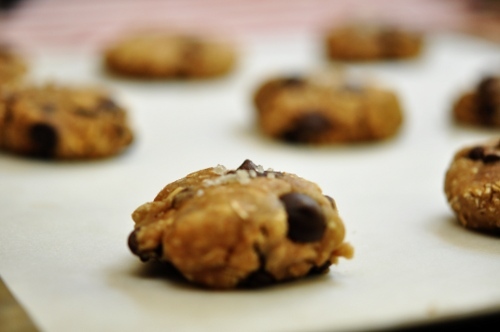 I’ve been holding my breath waiting for your promised chocolate chip cookie recipe that is…gasp…better than cowboy cookies! Oh my, I cannot wait to try these!!! I love salty and sweet together. Welcome back! Gorgeous post, Bria. You know, you can come and go where life takes you, and I won’t judge. Especially when your posts are this lovely. What a perfect combination of flavors for a cookie. Love the addition of brown butter and grey sel de mer! Can’t wait to try these (well, the gluten free version, anyway)! These are right up my alley. Salty + sweet = heaven. Can’t wait to make some. 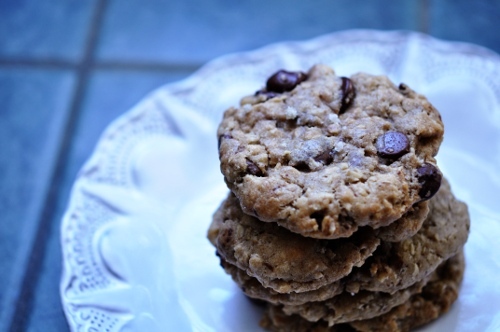 Bria - now I know why your cookies had the perfect mix of sweet and salty — I love this combination! I hope I find time to make them….I started a new job in April and it’s left me little time to blog and cook as much as I like, too. I came over from Dishy Goodness to check out the salty cookie…because I love salty cookies, and discovered that your secret is the same as mine! I am obsessed with brown butter and many of my fav recipes feature it. 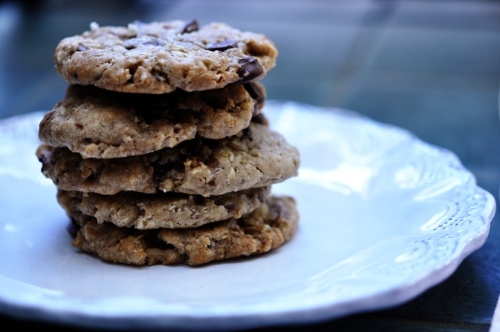 It’s just so ridiculously good tasting, I imagine these cookies rocked it pretty hard! Those cookies look fabulous! I have never heard about browning butter but I sure do like the idea! I look forward to coming back and visiting your web site and please check mine out too, when you have a chance. Hey, I finally made these.. yum!! delicious. Definitely a keeper.. who’d have thought the browned butter thing would make such a big difference! I know what I am doing this weekend! Gorgeous, they looks so yummy. That recipe looks excellent! Thanks for sharing! The Salty Spoon is powered by	WordPress 2.7 and delivered to you in 0.234 seconds using 24 queries.